Then, again when I was younger, at the beginning of 2000s, Seth Godin’s Purple Cow and The Cluetrain Manifesto were two pieces of work I’d always refer to, as well as Eric Ries’ The Lean Startup, later on when I was looking at how to become a better tech entrepreneur. If you want to become an entrepreneur and succeed in a competitive environment, then there are some evergreen books as well, for example: The Lean Startup by Eric Ries. Provides a great inside look at how the tech industry approaches building products and businesses. I would say The Lean Startup is the one that is very easy to digest and probably has most of the truth that you need to get things off the ground. It really teaches you how to do some experimentation. That was a very good one. [...] If you want to stay small and lean, The Lean Startup is a great place to start. But it's after reading "The Lean Startup" that I really decided to create and sell a service. This book was just the trigger I needed at the right time. When it comes to work books I definitely like to ask my leaders what their favorite books are. There are lots of repeats (Crossing the Chasm, Innovator's Dilemma & Solution, Lean Startup, etc), but every now and then someone will have a really unique one that I’ll read. I always read those right away. I’ve also taken book recommendations & then not read the book for like a year. I’ll go back and say, “Hey I finally read that book you recommended forever ago.” It’s fun. The Lean Startup by Eric Ries because it taught me how and why many businesses fail early on. Also, many of the principles found within the book can be found and applied outside of actual startup companies. The Lean Startup is the book whose lessons I want every entrepreneur to absorb and apply. I know of no better guide to improve the odds of a startup's success. At Asana, we've been lucky to benefit from Eric's advice firsthand; this book will enable him to help many more entrepreneurs answer the tough questions about their business. Eric Ries unravels the mysteries of entrepreneurship and reveals that magic and genius are not the necessary ingredients for success but instead proposes a scientific process that can be learnt and replicated. Whether you are a startup entrepreneur or corporate entrepreneur there are important lessons here for you on your quest toward the new and unknown. Business is too important to be left to luck. Eric reveals the rigorous process that trumps luck in the invention of new products and new businesses. We've made this a centerpiece of how teams work in my company . . . it works! This book is the guided tour of the key innovative practices used inside Google, Toyota, and Facebook, that work in any business. Every founding team should stop for 48 hours and read Lean Startup. Seriously stop and read this book now. I make all our managers read The Lean Startup. One of the most important things that sets people who are successful at being part of startup teams is how comfortable one is with uncertainty. I have heard people say even working at a big corporation is about dealing with uncertainty -- not the same. This is about incremental progress and establishing radical metrics that go beyond vanity. I have always hated long and laborious business plans that try to project too many years out -- the market moves too fast for that. The ability to act and iterate quickly (and being comfortable with that) is as important as setting the "strategy" for a company. Of course, not long after reading the summary document, Eric Ries brought out his book The Lean Startup - which is clearly a must read. The other books that contributed to my learnings are “How to win friends and influence people”, “The Lean Startup” & “ The 7 habits of highly effective people” I’m sure you have gotten much responses regarding those books and how much they have helped managers/CEOs/entrepreneurs. The lessons from these books were very critical in providing me a direction. They don’t often provide clear answers on how to create a successful business, but what they teach are the principles and techniques to run one. 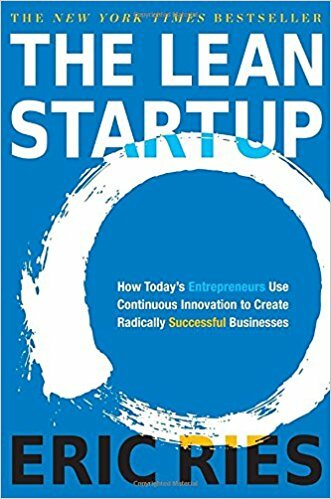 Another book I would recommend is The Lean Startup by Eric Ries; it basically explains the ins and outs of starting a business and how to keep it efficient, effective, and open; definitely a great read for future business owners! I truly believe there is a time for each book, and it's important to read the right books at the right time in your life. Older non-business books (Hermann Hesse, Proust, Nietzsche, Camus, Sartre, Thomas Mann, Susan Sontag, Roland Barthes, etc.) tend in my opinion to contain deeper knowledge which can help one really find direction in life. Second best would be "non-vertical" books which can support in developing either communication skills (Non Violent Communication, Radical Candor) or methodologies (Lean Startup, Lean Customer Development). For tech startups, I would always suggest reading The Lean Startup by Eric Ries. It’s a good start for someone interested in learning a few tactics to minimize startup costs when starting their company. Despite all the hype, it truly is a great book on architecting early stage startups. It has helped shape the way I work and build products, by making me a believer in keeping things as lean as possible for as long as possible, while slowly improving and validating your product. Business can be a risky proposition, and by taking this methodological, almost scientific approach, you mitigate risk and maximise your chances of success. I will strongly recommend anyone who wants to run his or her own startup to get this book. The Lean Startup method teaches you how to drive a startup, how to steer, when to turn, and when to persevere-and grow a business with maximum acceleration. I applied the Build-Measure-Learn model into my own startup Park N Parcel, the key is to validate all your assumptions and gather market feedback of your services/product via minimum viable product (MVP). To me, this book is like a bible. I keep reading it to constantly remind myself about the lean startup approach. I read The Lean Startup just after leaving my job at McKinsey & Co., when I was just beginning to think about startups. The advice it gives has become part of the core cannon of startup advice these days, and might feel like old rope to someone starting out now, but it was eye-opening for me. I ended up taking on small product challenges at GoCardless as a result of the iterative approach it espouses, which also fitted the way I’d worked at McKinsey before. I’m not sure I would have ended up running product at GC if I hadn’t read that book. As a first-time entrepreneur, I have to say “The Lean Start-Up”, by Eric Ries. It taught me a lot about the need to constantly test one’s vision and to adapt and adjust before it's too late. This was extremely helpful because as a perfectionist, my propensity was to launch the Gift-It-Forward platform only when it was “perfect” (which we know never happens!). The book convinced me to launch with a Beta or Most Viable Product (MVP) that was good enough for launch, allowing me to validate my concept and site early with real users, which was invaluable. I read a lot of different business and startup books, but I think this book is the godfather of books for startups. After this book was published, it changed the way me and many other founders think about the way we build products. "The Lean Startup" by Eric Ries is one of the book that fundamentally changed the way I approached creating a new business. Of course by now this might have been considered a cliche, but it is so fundamentally important that many of the newer entrepreneurs fail to think that way. As a first-time entrepreneur, the book that really helped was 'The Lean StartUp'. It's a roadmap for anyone starting off as a one-person company with limited resources. I would highly recommend this if your approach has been to fix every small detail before launching your business. It's important to start with a Minimum Viable Product that performs the basic functions, and after proof of concept, can be built into the full-scale product. I think this is the ABC for budding entrepreneurs. It is easy to read, covers many useful techniques and models for entrepreneurs. A classic. When I read Eric Ries' Lean Startup I loved the concept of MVP and applied this to features in TimeDoctor, we would simply add a link to a feature in a dashboard without building it to see whether people wanted that feature. We would also take features away to see if anybody got angry about it being gone. This book teaches you how you can avoid spending time, money and energy on unnecessary things while you are building a company. Overall it helps you build a sustainable business in a lean way. The Innovator’s Dilemma, The Lean Startup, and Zero To One are the defining trilogy of intellectual thought on the art and science of modern technology startups. Virtually every page of each is open to debate and yet as a whole they provide intellectual scaffolding for our endeavors that I wish had existed when I started in 1994! I am currently re-reading The Lean Startup, to refresh certain aspects of this kind of mindset for current and future projects.